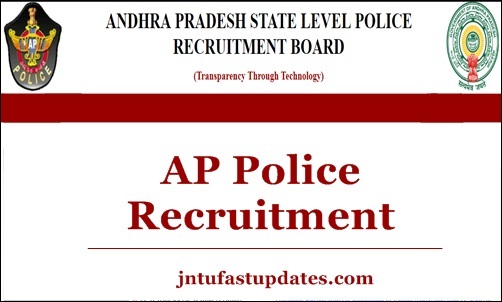 AP Police SI Notification 2018 Online Application Form: APSIPRB has released Police Recruitment Notification 2018 for 334 Sub Inspector, RSI, Deputy Jailors, Fire Officers Vacancies at slprb.ap.gov.in. Eligible candidates can apply online or download Application form from 5th November to 24th November 2018. The Preliminary Written Test will be held on 16-12-2018 (Sunday) – Paper-I from 10.00 AM to 01.00 PM (3 hours) and Paper-II from 02.30 PM to 05.30 PM on the same day. The registered candidates may download their Hall Ticket from the website (08) days before the date of Preliminary Written Test. (a) For the Post Code Nos. 11 and 12 – both Men & Women are eligible. (b) For the Post Code Nos . 13,1.4 and 16 – only Men are eligible. (c) For the Post Code No. 1.5- only Women are eligible. i) For the Post Code Nos. 11, 12 & 13: Must have attained the age of 21 years and must not have attained the age of 27 years as on 1st July, 2018 i.e., must have been born not earlier than 2nd July, 1993 and not later than 1st July, 1997.
ii) For the Post Code No. 14: Must have attained the age of 21 years and must not have attained the age of 30 years as on 1st July, 2018 i.e., must have been born not earlier than 2nd July, 1988 and not later than 1st July, 1997.
iii) For the Post Code No.15: Must have attained the age of 21 years and must not have attained the age of 27 years as on 1st July, 2018 i.e., must have been born not earlier than 2nd July, 1993 and not later than 1st July, 1997.
iv) For the Post Code No.16: Must have attained the age of 18 years and must not have attained the age of 30 years as on 1st July, 2018 i.e., must have been born not earlier than 2nd July, 1988 and not later than 1st July, 2000. The candidate must hold, as on 1st July, 2018, a Degree awarded by any University in India, established or incorporated by or under a Central Act, Provisional Act of State or of any institution recognised by the University Grants Commission or any other equivalent qualification. In the case of a candidate belonging to Scheduied Castes or Scheduled Tribes, as on 1st July, 2018, he/she must have passed Intermediate or any other examination recognised by the State Government as being equivalent to Intermediate and should have studied Degree. The candidate must hold, as on 1st July, 2018, a Degree awarded by any University in India, established or incorporated by or under a Central Act, Provisional Act of State or of any institution recognised by the University Grants Commission or any other equivalent qualification. Distance Education: Candidates who have obtained Degree through Open Universities / Distance Education mode are required to have recognition by the University Grants Commission / AICTE / Distance Education Council, as the case may be. Unless such Degrees had been recognized by the relevant Statutory Authority, they will not be accepted for the purpose of Educational Qualification. The onus of proof of recognition by the relevant Statutory Authority that their Degrees / Universities have been recognized rests with the Candidate. 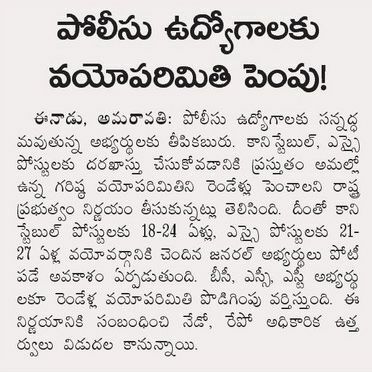 a) Candidates with local candidature of Andhra Pradesh belonging to OCs and BCs applying for the Posts of SI Civil or equivalent viz., SCT SI (Civil/AR/APSP), Deputy Jailor (Men), Deputy Jailors (Women) in Prisons & Correctional Services Department and Station Fire Officer in A.P. Fire & Emergency Services Department (Men) have to pay a fee of Rs.600/- towards processing of application, PMT/PET, written examinations etc. Local candidates of Andhra Pradesh belonging to SCs and STs have to pay only Rs.300/-. Those who intend to apply for more than one category of posts need to submit only one application form. Applications submitted after 1700 hrs on 24.11.2018 will not be accepted’ Incomplete applications will not be entertained.